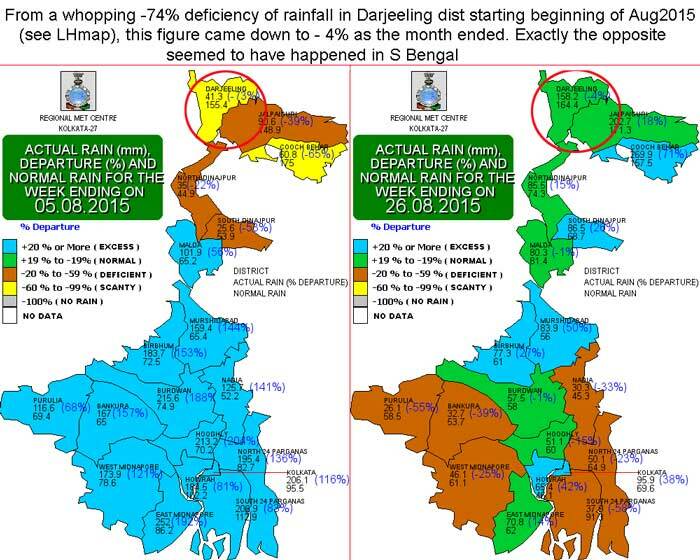 Gangtok, Darjeeling and Kalimpong had deficient rainfall in Aug2015 whereas Kurseong and Mangan (N Sikkim) had an excess in rainfall. Excess rainfall seen in S Bengal was the aftermath of Cyclone Komen which formed in the Bay, end of July2015. No other significant system affecting our region formed in the Bay of Bengal in Aug2015. There were no major landslides or fatal landslides in Darjeeling and Sikkim.